Video Production Company & Video Crews for Greensboro, North Carolina & beyond. Digital Production Group of North Carolina specializes in Corporate Videos from internal training videos to corporate communications and everything in between. Whether you're shooting a conference that you want to distribute to the rest of your company or have an announcement from the your CEO we can deliver your message with the right gear at the right price. Call now for a consultation on our corporate communications video production capabilities and find out how we can help you. With over 20 years of video production experience The Digital Production Group of North Carolina can produce your next TV Commercial, Informercial, Web Advertising Campaign or whatever your advertising needs are. Our client list encompasses some of the largest compaies in America like Energizer, Duracell, VF Corp, P&G, TE Connectivity, Sherwin Williams, Flint Trading, JJ Keller, Build-A-Bear all the way down to smaller local North Carolina companies. We aslso produce commercials all around the world . . . for the past 5 years The Digital Production Group has been producing between 2 - 3 jobs per year in Japan and Jamaica. As you can see NO JOB IS TOO BIG OR SMALL and we'll go anywhere that the work takes us. With studios in Greensboro NC and New York City Digital Production Group offers the full spectrum of video services: Project Concept Development, Scripts, Crews, Shooting, Editing and Delivery. Our in studio video productions offer everything from a 45' robotic crane, 12' jib, teleprompters, green screen, depth of field adapters, a wide variety of fresnel lighting and flourescent depending the look you are trying to achieve. 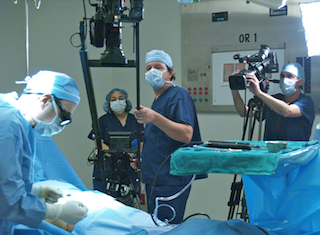 We have started shooting all jobs in HD to ensure their shelf-life into the future, but still offer standard def video production in addition to our HD Video Production and Streaming Media Offerings. We're very excited about our new Reality TV Division which offers an end to end solution which brings your television show, or any content you desire, to a TV Channel that we build for you. To find out more, click here to view our Reality TV & Viral Video Production Page. If you're looking for stills and video with that Canon look, we have it. 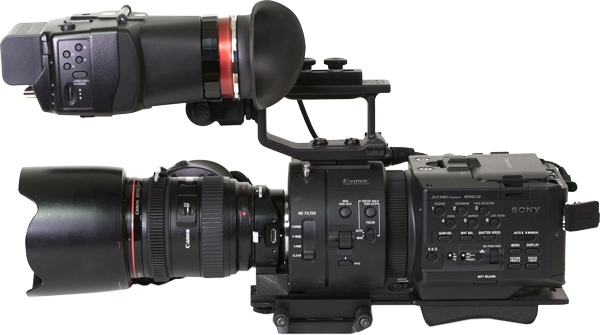 We run both the 5D MIII and 60D as traditional still DSLRs and as Video Production Units. Both cameras have shoulder mounts that slide into a video production tripod for smooth professional cinematic moves and pop off in a moment with a quick release allowing you to go hand held or shoulder mounted in the blink of an eye. As well our DSLR video cine rigs include the Tascam 60D for audio recording separately or it allows you to mix audio to the 5D or 60D so that you have perfect sound on tape everytime. This system allows us to use our Sony wireless kits for audio, boom poles, traditional lavaliers and more just like you would any video camera. Make sure to ask about our Cine Lenses for all our rigs! The Sony FS700 cine camera allows you to up the ante over the Canon 5D Mark III and Canon 60D to bring your music videos, corporate videos and commercials to life in full sony cinematic style. Shooting with Sony's Super 35 Chip system in Sony Raw or SLog combined with the ability to go into beautiful stunning super slow motion may be just the thing your next project needs. And we have all the toys for it from focus pulls to lens shades and rails to add on even more toys. If you need that slow mo, then look no further as the Sony FS700 will shoot 480 fps in 720p or 240 fps in 4K Raw! This camera will even shoot 960 frames per second at a smaller frame size. Throw a cine lens on the camera and you've got cinema quality slow motion at your finger tips! Make sure to ask about our Cine Lenses for all our rigs! Our latest addition to our family of cameras does shoot 4K Raw, but it does a lot more than just 4K Raw. We can also shoot in 2K Raw, 2K, 1920x1080 as well 1280x720, standard definition and in PAL as well. We have been shooting the Sony FS700 for about 6 months now, but have held off on our announcement until we had it fully rigged and ready for action. So far we've shot many commercials, industrials and web series with it. The results are spectacular! We have rigged out our FS700 with the Kinotehnik electronic viewfinder as pictured, we also have a rail system which holds our matte box, focus pull, grip relocator and our quick release system which allows our DP to go from tripod to hand held in the same way we do with our traditional ENG cameras. Going from Cine-style shooting to ENG style is no longer a hassle with DPG and our new Sony FS700! In addition to having a full rig designed specifically for the FS700 we also love to use it on the jib, dolly and steadicam. Best of all if you are shooting in 2K Raw or simply 1920x1080 the price increase for this unit is not much more than our traditional ENG rigs. So please call for a price quote on your next gig. Our Video Production Studio has a cyc that is currently painted Rosco Green for Chroma Key Video Productions. The studio is 24 feet wide by 40 feet deep with 14 foot high ceiling where the grid starts. The part most people use is 18 feet wide, but the cyc runs the entire 24 feet width. Our video production studio handles both video productions as well as still photo shoots very well. With the addition of a new 17" teleprompter we can now provide teleprompting services in the studio or field. Our field production services include all our usual levels of video production:HD Video Production, Broadcast Video Production, Standard Definition Broadcast to Industrial and Corporate to our Streaming Media Production. We offer our 12', 8' and 5' jibs for field production as well as our depth of field adapters which really make your video projects come to life giving you that film look that everyone wants these days. The idea with field production is that somethings have to be shot in the field, at your offices or on location and that's one of our specialties. From NASCAR to the OR, from North Carolina to Japan we've done it all. People often ask if we travel to shoot. The answer is a resounding yes. We have been sending crews to Japan to cover different events for five years now. For the past three years we have been bringing between 5 and 15 person crews over to shoot, edit and uplink footage for domestic broadcast use. Last year we saw the release of Final Cut X which looked and acted more like another version of iMovie. Not what we were hoping for from our friends at apple. So, Premiere has stepped it up a notch with the release of the Creative Cloud and we jumped on board. Creative Cloud offers a seemless workflow from producers using Prelude to log their media, Premiere, Photoshop, Illustrator and After FX. The Workflow between AfterFX and Premiere is the most impressive part of the suite. Now, we didn't make this jump hastily. We were early adopters of Premiere in 1990. It was so horrible I laughed at the idea of going to Premiere again. After seeing the power of Premiere and how it works with After FX, Photoshop, etc. there was no question our minds that Apple quit making professional video editing tools because they could not keep up. Yes, we still offer Final Cut 7 and we still have it loaded on an edit system, but we don't do new projects on Final Cut Pro unless a client needs it that way. We also still run a Vegas Pro edit suite for 2 clients in particular who need to keep releasing videos in Windows Media 8 and the only way to get that legacy version of Windows Media is by not letting it go. So we are still backwards compatible to a degree. And if you are a client of ours we still can edit your older projects at the drop of a hat. If you've got a quick turn-around project we'll put a graphics editor working side by side with our video editor. Our basic video editing rates include your choice of Beta SP, DV CAM, DV CAM Wide Screen, HDV JVC Format, Mini DV, DVD and we even have a 3/4" machine that still works like a champ. DPGNC just added a portable laptop edit suites that can be used for on-location editing like we do in Japan or simply as a way to wrangle your data while shooting productions in the field and do Quality Control on your media right there on location. Digital Production Group is Global! 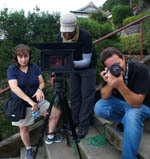 We take video production wherever you need it from New York to Tokyo to the beaches of Jamaica. We've been covering events and shooting video in Japan since 2 to 3 times per year since 2005. Normally we shoot in Japan in October, November and December and can offer local Greensboro Video Production rates in Japan. Let DPG be your source for video production in Japan whether you need man on the street interviews, coverage of an event or simply beauty shots we've got the locations pre-mapped for you, interpreters set up and access to supplimental gear like dollies and jibs that we can't transport in economically. Digital Production Group took on the edit role in a documentary film project by a first time director/producer last year. The film won Documentary of the Year from The Moving Pictures Film Contest. The film also picked up the Director of the Year Award from August Sun Film Festival as well as an Honorable Mention at the Route 66 Film Fest and here in 2009 it's scheduled to be screened at International Film Fests from Egypt to London to Belgium and more. Digital Production Group adds more new High Definition Video Production Gear to our already stellar lineup of gear. We have waited out the whole P2 issue and gone straight for a camera that records to SDHC cards which are affordable for both field production and archival purposes. The GY-HM750 which shoots in High Def 1080i, 1080p, 720i, 720p as well as standard def and shoots both slow motion video and undercranked video for sped up shots. We now have a matching pair of the GY-HM759s as well as the AF100. The AF100 is a very impressive camera allowing us to shoot large format chips with cinema style lenses. In addition we have the AG-HMC150 shoots in 1920 x 1080 at 60i, 30p, 24p Native and what's better is that in the 720 mode it will also shoot 60i, 30p and 24p Native. So now it's your choice what format to shoot for your job. Primarily we bought this camera to go where the larger shoulder mounted cameras couldn't. It works perfectly for jobs in tight spaces like cars or in tight offices and the wide angle lens that comes with it is nothing short of spectacular. This HD camera will also work nicely for cranes shots. Last year was also a year of growth for Digital Production Group and with growth comes new capabilities. We added 3 new cameras, a 12 foot crane and a teleprompter as well as new cameras to our arsenal of quality video production packages. Both new camera packages have both the 16x Fujinon High Def lens and the 13x Fujinon Wide Angle Lenses. The feature that sets these cameras ahead of the pack is their lenses. In addition Digital Production Group now offers a package of prime lenses that will make your next production look like it was shot on film. After having bought our JVC HD110 earlier this year with the beautiful High Def Wide Angle Lens we were easily sold on getting the newer version of it to go along on shoots. We can now match our cameras using the SD card and set them up for any number of uses beginning with straight news and working your way to digital cinematography. To that end we have also purchased the Red Rock M2 Prime Lens adapter which will allow us to shoot with any lens that you can dream up from an ultra wide angle to the super telephoto primes. In addition to the crane that we added to our production gear earlier this year we have also added a steadicam to the lineup. Digital Production Group is poised to deliver everything from News Video Production to Corporate and Industrial Video Production to Digital Cinematography and Television Quality Webisodes and Live Switched Events in either High Definition, Standard Def 16 x 9 or Standard Def 4 x 3. This has been a good year for us. Between our stunning Hi Def Goodyear Wet Tire Shine Commercials and our award winning Public Service Announcement campaigns we have been very busy. Our Goodyear Wet Tire Campaign started out as a single :30 second commercial, but we managed to show our client the power in the economy of scale and produced a :60 spot with the same footage and with an additional shoot day and the help of Tommy Baldwin we produced an industrial that has been used on their tradeshow trail. In addition we provided a still photographer to shoot the Goodyear Wet Tire Shine product shots for their national advertising campaign. This series worked out so well that we are now working on a bigger campaign showing off their whole line of products. Ad Agencies covet and broadcaster outlets respect. The Progeria Foundation needed a series of Public Service Announcements for Radio and Television and we delivered. We actually went the extra mile and delivered a Times' Square Billboard for them as well. This project starred Ted Danson. After that we went on to make a series of Television, Radio & another Times' Square Billboard for the LAM Foundation...this series also won the Ad Council Endorsement. Currently we are in production on jobs with the Japanese Consumer Electronics Show, Tokyo Auto Show & The Broadcast Association of Japan as well as Energizer, Build-A-Bear and RideMakerZ to name a few. We are also in production on two documentaries which we will put links to here once they are completed and ready for distribution. It was also a pleasure working on our last few industrials and film shoots and providing only the crane, camera and operator or simply the crane and operator. We are NOT a rental house, but we have no problem delivering a la carte video gear to your shoot and working with other production companies to make your project a success. For insurance purposes we have to provide our operator for our gear. The biggest asset that Digital Production Group offers is the ability to deliver your message efficiently and seamlessly across the multi-media spectrum at very low rates. Michael Diiorio is a 20 year veteran of the advertising, public relations and broadcast video production industries in New York City. After building and selling two video production companies in New York City, Michael moved his current company, Digital Production Group, to Greensboro 6 years ago to be closer to his family. Whether you are a video production company looking to pick up a crew in North Carolina, South Carolina, Virginia or the Washington DC areas or a company in need of an industrial, video news release or other turnkey video production services Michael can take care of your video production needs. Digital Production Group's North Carolina office provides basic service area without travel charges includes: Raleigh, Durham, Chapel Hill, Winston, Salem, Charlotte, Concord, High Point and of course Greensboro, North Carolina. Digital Production Group's New York office provides video production services and crews to the tri-state area including New York City, Connecticut and New Jersey. Digital Production Group owns Beta SP field packages, DV Cam field packages & Mini DV field packages for ENG, EFP or live switched events. 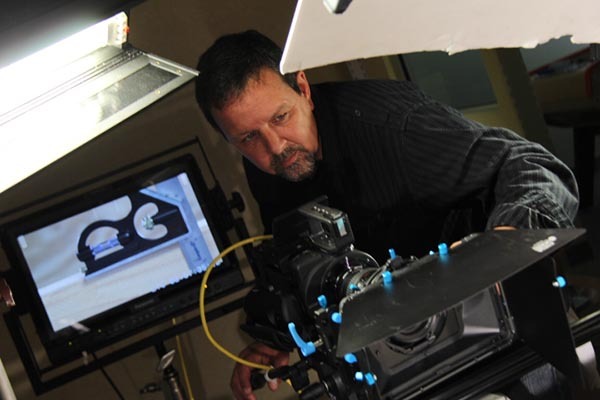 We provide high end video production to North Carolina & beyond at prices that won't be beat. Call now or click to check availability and pricing for your video project. Add on a DVD Recorder for only $60/day & we'll throw in a free 8 hour DVD so that you can walk away from the shoot with a copy of your raw footage and start your paper edits immediately. We own many other pieces of supplemental pieces of gear, like teleprompters, backgrounds, additional lighting and more, that can be at added at little or no cost to you. Please call us at 336.420.2761 if you have a project that you need a video crew, a project that needs a producer or a campaign that needs coordination. Heading up our New York office are Mark Sofer and Amy Fisher. Both Mark and Amy strengthen the Digital Production Group in their own ways. Mark Sofer brings over 20 years of Live Event Production experience to the table and Amy Fisher brings more than 20 years of writing and producing experience.